Search Results for "daddy and daughter"
Dad and daughter having fun in a clean house. A man with broom and dustpan and girl with a vacuum cleaner. Pastime father and daughter together. Father and daughter relationship. A happy family. Close-up of hands playing video games. Dad and daughter hold joysticks in their hands while having fun on the game console. Father and daughter relationship. A happy family. Dad and daughter are playing in the fresh air. Evening sunshine, beautiful smiles. Bearded man sitting on the sofa and playing video game holding joystick with his little daughter close up. Concept of happy family. Small girl have fun with dad. Father and daughter relationship. Portrait of dad with cute daughter and laptop sitting in the living room on the couch and talking about something funny. Father and daughter relationship. A happy family. Close up portrait of dad with cute daughter and laptop sitting in the living room on the couch and talking about something funny. Father and daughter relationship. A happy family. Portrait of dad with cute daughter and laptop sitting in the living room on the couch and talking about something funny on the background of mother. Father and daughter relationship. A happy family. Close up portrait of dad with cute daughter sitting in the living room on the couch and talking about something funny. 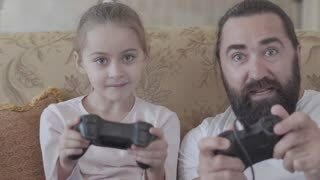 Portrait of a bearded dad and cute little daughter playing video games on gaming console sitting on the couch at home. Father and daughter relationship. A happy family. Bearded dad and a beautiful little daughter paint with flamasters sitting at a table on a day off. Pastime father and daughter together. Father and daughter relationship. A happy family. happy modern family. Dad with a little daughter lying on the floor in the living room and looking at the camera. happy modern family. Dad and his little daughter are measured by force on the floor in the living room.